Hi again (just posted a few minutes ago)! New question that deserves its own topic: I imported an existing manuscript, and I'm really starting to like the idea of "sections" as a way of bookmarking my complicated novel. However, I thought I could just highlight a section of existing copy, click "Create New Section", and voila! I'd now have a new section out of existing copy. However, that doesn't seem to be the case. When I do the above, a new blank section gets added to the end of my chapter. Help? 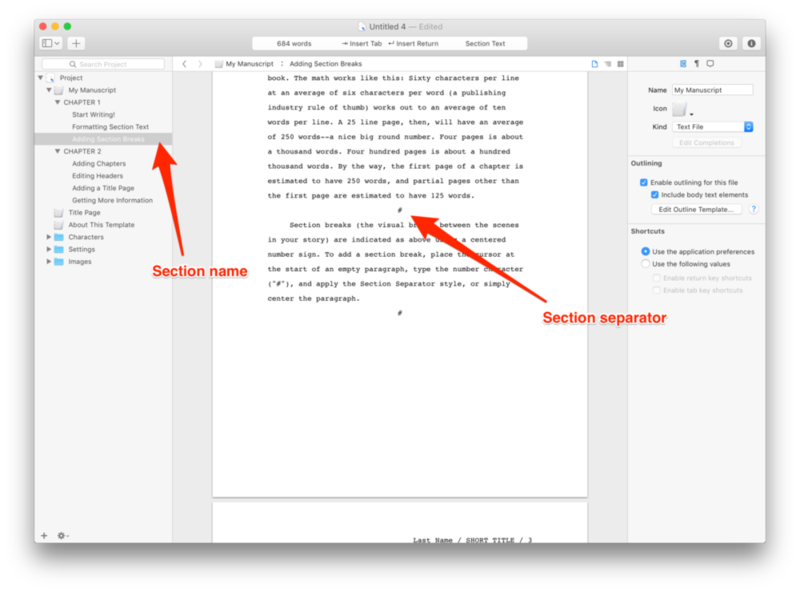 You can split a section by adding the section separator (the "#" character) on a blank line. This will create a new outline entry, which you can name in the project view. The "Adding Section Breaks" section of My Manuscript in the Novel template has more information. Ah, I must have missed that bit. Thank you.